Have you worked on a team and that that seemed to always get stuck in the weeds of details? How about a team that was able to create hundreds of new ideas, but never able to follow-through and implement them? Learn about the inner-workings of your team with this powerful report, and discover how to make your team more effective. Featured in Ray Dalio’s New York Times Best-selling book, Principles, The Team Dimensions Profile helps individuals work from their strengths on team. It identifies their most natural team role, while giving them additional appreciation for the contributions and talents of others. Organizations use it to build team unity, cultivate innovation, and reduce project cycle time. Additionally, the profile introduces the “Z” Process to help teams understand the stages of a project. 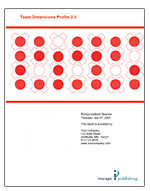 Team Dimensions Profile products include a paper version, an online version, group reports for the online version and a facilitation or training kit. 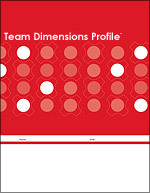 Click on a link below to learn more about Team Dimensions Profile products.